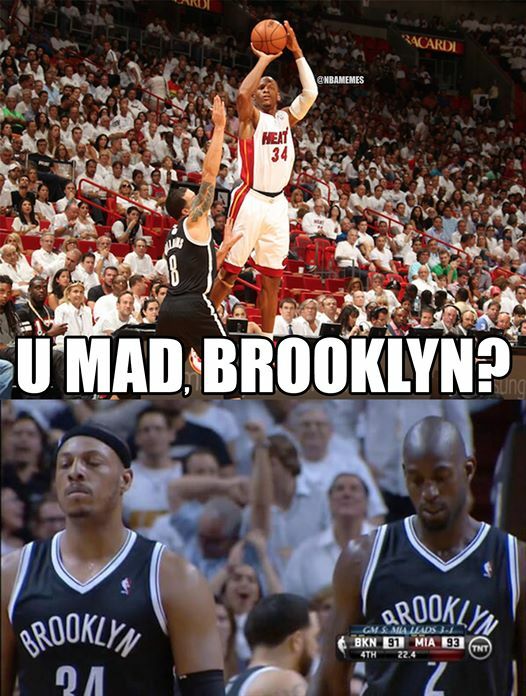 The series between the Miami Heat and the Brooklyn Nets is over a lot sooner than many expected. That’s what happens when some teams turn into their extra gear in the playoffs, while others stay back and reminisce about what happened in the regular season. It also lead to quite a few memes making fun of Paul Pierce and Kevin Garnett. Not for the first time and probably not for the last, Ray Allen came through for the Miami Heat. The defending champions were chasing the Nets all through the second half before pulling off a 12-0 run in the end of the game, capped off by Allen hitting a 3-pointer that finally gave them the lead and then some excellent defense from LeBron James on Joe Johnson. This was something of an extension to the playoff series between the Heat and the Celtics in 2011 and 2012. Paul Pierce, Kevin Garnett. The two veterans were hoping that this stop, maybe the last in their career, was going to give them a decent shot at one last title run. They fell short, although it didn’t stop them from non stop talking about how they were going to beat and handle the Heat. People are waiting for the Miami Heat around every corner since the moment LeBron James signed for them in 2010. Except for losing in the NBA finals to the Dallas Mavericks in 2011, he and his team have been disappointing those wishing them ill at every important moment.